'pick-me-up' from the smooth and aromatic spirited GALLIANO liquor. delectable, refreshing dessert a 'pick me up' as well as 'pull me away'. I never imagined how pertinent it had become for this following post today. 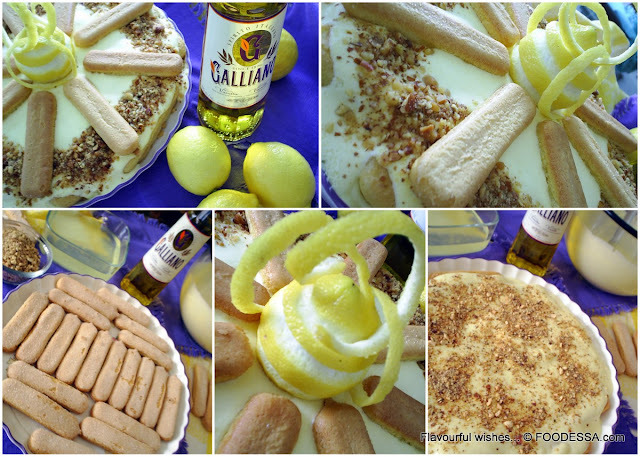 I'm offering to 'pick you up' with this delightfully decadent Galliano Lemon TiraMiSù. For some, a relaxing soak in a spa tub will relieve the stresses of the day. Personally, I prefer being taken away through the smooth sheets of lemony cream. My tension slowly gets alleviated when I'm in my own creative bubble. lemons and a very flavourful liquor named 'Galliano' which came to inspire me. I’m sharing with you one of my blissful moments in the kitchen. TiraMiSù classic: chocolate-coffee ExtraOrdinairio...and re-styled it. Usually, when there's a special occasion I step it up a notch in the creative department. However, the day this amazing outcome was to bless my eyes and sense of smell came at a time where no special occasion was planned. The inspiration strangely came to me because I had some Mascarpone that was begging to soon compliment a sweet and sumptuously refreshing treat. Therefore, the mood struck me to make a lemon flavoured TiraMiSù. I started quickly scouting through my pantry and discovered I still had a few Savoiardi cookies and an unopened bottle of 'Galliano' that had been gifted to me lately. Since this spirit is blessed with a hint of anise along with the incredible essences of vanilla, honey, ginger and citrus...I figured this would be a great avenue for the cookies and cream to blend and pair with. GALLIANO liquor (a.k.a. Liquore Galliano L'Autentico)...originated in 1896 from Livorno in the Tuscany region of Italy. The classic Harvey Wallbanger is what most people would associate the slightly unknown and under-used liquor. This mildly sweet, herbal liquor holds a hint of anise, however, more pronounced with the aromas of vanilla, honey, ginger and a hint of nutmeg. Once the end creation came to light...I was exhilarated with a sense of satisfaction as well as saddened at the same time. Here was this beautiful and very elaborately sized dessert and only Hubby and I were ready with forks in hand. I quickly remembered that it was best to wait at least a few hours before digging in. I then, immediately called Mom who loves lemon based desserts...especially since she tried my Lemon mousse frozen pie. Believe it or not, she's made it her favourite go-to fresh tasting dessert. Actually, her last try looked nicer than mine did...hmmm. After having kindly accepted my afternoon invite...my parents came flocking through the doors like two pigeons in anticipation of the refreshing promised delicacy. As soon as they saw it, the very welcomed compliments were a few seconds short...and then the forks found themselves in hand fairly quickly. They not only had their regular sized portion...they both asked if they could be possibly offered a second portion!?! Wait a minute...aren't these the same people that say they don't really have a sweet tooth like mine? I'm the dessert fanatic in the family...hmm...I beg to differ. Am I becoming a bad influence or was this lemon TiraMiSu downright scrumptious? If you wish...this recipe can easily be made smaller since the measurements are in even numbers. a touch of honey...vanilla and anise extracts. Finely grated ginger as well as a hint of nutmeg can be added also. Make sure the cookies are fresh...otherwise your tiramisu will undoubtedly end up too soppy. You'll also end up short with the lemon/ liquor dipping liquid. If you're concerned about the consumption of raw eggs....pre-freeze the separated eggs a few hours beforehand. Leave enough time for them to thaw and come to room temperature in order for them to be properly used.
. 'Strega' is another Italian herbal liqueur which can be used as a reasonably acceptable substitute.
. An inexpensive alternative is the 'Neopolitan' liqueur produced in North America. This ingredient is the critical part of why this dessert has become the chosen one among the top 5 Italian chilled desserts. It can't be stressed enough that there isn't an authentic substitute that will honour the dreamy Tiramisù. I, once again wanted to create something a little more elaborate for a special occasion. A round presentation platter with slightly raised sides with a diameter of 12 inches (30cm).
. About 1 hour ahead of time...take out the mascarpone cheese and eggs out of the cold. Set aside.
. In a medium bowl, combine the lemon juice, liquor and water. Set aside. ...making the MERINGUE: . In another medium bowl and with an electric mixer, beat the egg whites with the pinch of salt until you get slightly soft peaks. Continue beating while adding half the quantity of sugar until medium-stiff peaks have been realized. Cover and place into the refrigerator until needed.
. Meanwhile, in a large bowl, combine the egg yolks and the remaining sugar. With the mixer, immediately beat them together until a thick creamy pale consistency is achieved.
. Add the mascarpone and continue to beat the mix until smooth consistency.
. Now, with a spatula, gently fold the meringue mix into the cream mix. Finish by adding the finely grated zest. Once more, cover the bowl with a plastic wrap and refrigerate for a minimum of 30 minutes.
. Prepare the platter of your choice and figure out the layout as well as pre-distributing the first layer of cookies to facilitate the initial part of the assembly. You'll probably need to break some cookies in half in order to fit the complete surface. This will avoid any surprises while in the midst of having soaked cookies on hand. For this particular chosen presentation platter...the first two layers held a total of 20 Savoiardi cookies per level. The remaining 8 cookies served as decoration and placed like a star pattern branching from the center.
. It is best and more efficient to work as quickly as you can. To wet the cookies into the LEMON mix, hold one cookie in each hand as you DIP --TIP --TWIRL --LEAK both cookies simultaneously in order to avoid over soaking them.
. Immediately transfer cookies onto the platter as you place them side by side in a single layer within your pre-designed layout.
. With the aid of a ladle and spatula...spread a 1/2 of the CREAM mix over the first layer of cookies.
. Scatter, the first 1/4 cup (60g) of the roasted chopped nuts throughout the surface. Note: the cream may seem ‘liquidy‘...don't be concerned. Once the Tiramisù sets in the fridge, all the ingredients will set together into a unified delicious mass.
. Repeat another layer of soaked cookies and spread the remaining CREAM mix.
. Around the perimeter of the cake, generously scatter the remaining roasted chopped nuts.
. In the center, leave a small space for a decorative lemon with a carved out twirl.
. From that point, place evenly the 8 remaining cookies branching out from the center like a star pattern.
. For the center focal point, a fresh, well washed lemon can get carved. Leave the yellow skin in between and place the swirled peels creatively around it. it is highly suggested to place a few upward toothpicks and cover it with plastic wrap. Chill it for a minimum of 4-6 hours.
. For every additional hour it gets to set and relax, all the flavours will marry together and you will ultimately be rewarded with superior results. Leaving it alone overnight is better. Its freshness can also be held refrigerated between 2-4 days before serving. you'll certainly lift up your spirits. Savour the joy of life.